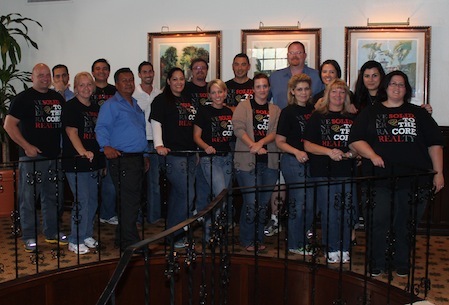 This past May, the Training Department hosted Venterra’s 2nd annual Mentor Workshop in San Antonio. This year the theme was “Make a Difference. Make it Happen. Make the Commitment.” The focus was on our positional training programs we currently have in place which consist of our Property Manager Mentor, Maintenance Manager Mentor, Assistant Property Manager Mentor and Leasing training programs. Incorporating the “WHY” into our current training materials so that all employees have a better understanding of not just “How” Venterra does it, but “Why” and the importance behind it. Mary Green, Bridget Sherrod, Joey Bruce, Kristi Gillespie, Jessica Nofsinger and Natasa Hadjigerorgiou. Chris Griffin, Diana Calderon, Ashli Butler, Candi Garland, Eastin Isaac, Jessica Nofsinger, Stephanie Snow, LeAnn Cordes, Lauren Brooks, Shana Jones, Veronica Mier, Adriana Galicia, Robert Dunn, Robert Herrera, Primotivo Berrospes, Barry Rhodes, Mel Hubbard, Jaime Galvan, Allen Rafieha, Tony Thanos, Brandi Polvado, Fabiola Celado, Sheryll Autrey, Floralicia Contreras, Chelsea Hubbard, Christy Hein, and Erin Cross.